When I had The Princess, I was only able to breastfeed her for four days because of two things: I had no idea about what to expect when you breastfeed your baby and I had no support. My daughter was feeding frequently so everyone in the family thought that I have very low milk supply and that I might be starving our baby. So, after four days, we bought a can of formula and started feeding her that from then on. It was a different case with my son. I was more informed about breastfeeding by the time I had him and was surrounded by blogger friends who support breastfeeding mothers. I successfully breastfed The Little Man exclusively for five months and mixed fed him soon after his 5th month (Unfortunately, I had to go on an unexpected out-of-the-country work trip and was not able to stock up on breastmilk). At 13 months, my boy still breastfeeds. Surprisingly, my now 2-year old daughter also breastfeeds every now and then! You see, arming yourself with information and being surrounded by people who support your decision to breastfeed can really help you with your journey. Moms today are actually very lucky because there are now a lot of support groups like MedelaMoms, who make sure that moms give their children the best nutrition, i.e. breastmilk. Committed to being more than just the Philippines’ authorized distributor of the most well-known and trusted brand of breastfeeding products, MedelaMoms is all about supporting mothers and babies in their breastfeeding journey. This is why they organize learning events related to breastfeeding and parenting, provide breastfeeding counseling if needed, and help coordinate breast milk donations whenever necessary, among other things. MedelaMoms wants to be one with you, moms out there, in breastfeeding. Breastfeeding can be very challenging — especially in the first few weeks. On my first week of breastfeeding The Little Man, I remember crying (yes, I was crying!) because of pain. I only had one baby in mind, so I cannot imagine how much more difficult it is for mothers of multiples! Don’t worry, though, because MedelaMoms has your back. 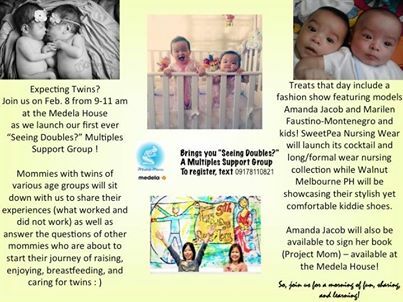 😉 MedelaMoms would like to invite all couples expecting multiples to come to the Medela House on February 8, Saturday, 9 a.m., to the launch of the “Seeing Doubles” Multiples Support Group. Moms with twins will talk about their experiences carrying, giving birth to, breastfeeding, and raising multiples! If you are expecting multiples, this is your opportunity to ask questions about your concerns and worries. The “multiples moms” who have been invited by MedelaMoms to speak are ready to help parents for the arrival of their own sets of multiples. Amanda will also be conducting a book signing and a limited number of her book, Project Mom, which is co-authored with Bianca Araneta-Elizalde. Copies will be on sale on that day, by the way! The event is free of charge, but please pre-register by texting or calling MedelaMoms at 0917-8110821 or sending an email to medelamoms@gmail.com. Thank you so much for sharing about the beauty of breastfeeding, and about the launch, Kim! 🙂 I SO love that your kids sort of tandem feed! So awesome! God bless you more and more!